Back in November CloudCred Community Manger Noell Grier reached out on Twitter and asked for help to write VCP Prep tasks for CloudCred. I responded and told Noell that I would like to volunteer to write some VCP Prep tasks. I had no idea how much or how little was going to be involved. She responded and let me know that she was happy to have a team mate to help write the tasks. At this point I was worried that I might have bitten off more than I could chew. Noell then sent me an email with details on what on section of the VCP5 blueprint I should write tasks for. Luckily, she also sent me a template that helped writing the tasks a little easier. After a couple months of writing tasks and inputting them on the CloudCred website, the VCP Prep tasks were ready to be launched. So the VCP Tasks were launched and the CloudCred website had a record numbers of users visit the site and complete tasks. It felt awesome to be part of something that was taking off really well. It was then announced that tasks that were submitted by users would be entered to win a Dell laptop. This really encouraged my to write more tasks and help finish writing tasks for the whole VCP 5 blueprint. Three other users joined the team and helped complete the VCP Prep tasks – Nigel Hickey (@vCenterNerd), Andrea Mauro (@Andrea_Mauro), and Mike Medrano (@GeekieMike). I really appreciate them volunteering and helping. It would have taking me way too long to finish it myself. After months of waiting, it was finally announced that one of the tasks that I had written was completed the most number of times and I had won the Dell laptop. It was a pleasure working with Noell on this project. She was patient with me while I finished each blueprint section. 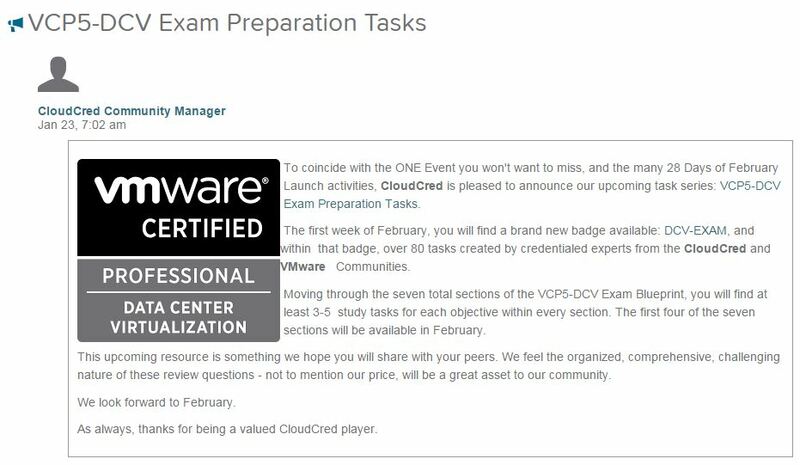 I am very grateful for the opportunity to help CloudCred publish the VCP Prep tasks. Today Cloudcred release the VCP5-DCV tasks. If you are practicing to take your VCP5-DCV, then these tasks are created just for you. The tasks will help you validate that you remember what you have been studying. There are 80+ tasks. Each tasks was based on the VCP550 Exam Blueprint. As we all know, certification & re certification are necessities when using and managing VMware products. CloudCred is poised to offer a comprehensive task series that helps professionals get ready for these challenging tests. 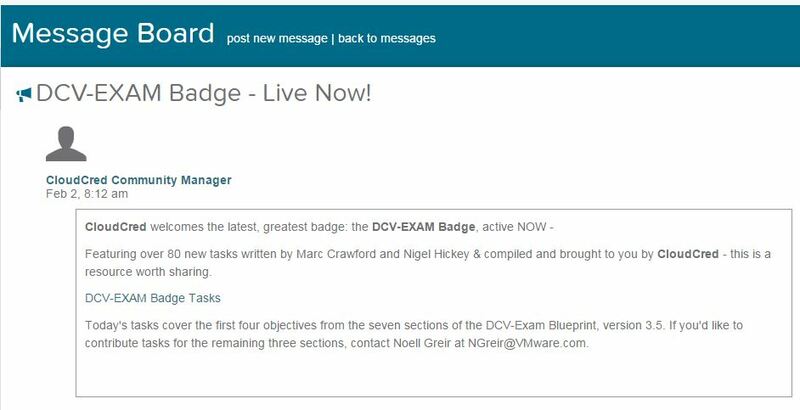 I have been working with Noell L. Grier at VMware to create tasks for the VCP5-DCV Exam . Part of the motivation to create the tasks for Cloudcred is that if you are the creator of the task that is most played between now and April 15th, 2014, you’ll take home the Dell laptop! So please complete the VCP5-DCV tasks with my name so I can win the Dell laptop!!! If you are not familiar with CloudCred, it is a new cloud computing training and recognition platform where IT pros can show off their cloud computing knowledge and skills and win prizes. Browse over to http://www.cloudcredibility.com to sign up and learn more about it. It is 100% free to sign up and use.